Who makes most money from the demand for cappuccinos early in the morning at Waterloo Station? Why is it impossible to get a foot on the property ladder? How does the Mafia make money from laundries when street gangs pushing drugs don't? Who really benefits from immigration? How can China, in just fifty years, go from the world's worst famine to one of the greatest economic revolutions of all time, lifting a million people out of poverty a month? Looking at familiar situations in unfamiliar ways, THE UNDERCOVER ECONOMIST is a fresh explanation of the fundamental principles of the modern economy, illuminated by examples from the streets of London to the booming skyscrapers of Shanghai to the sleepy canals of Bruges. 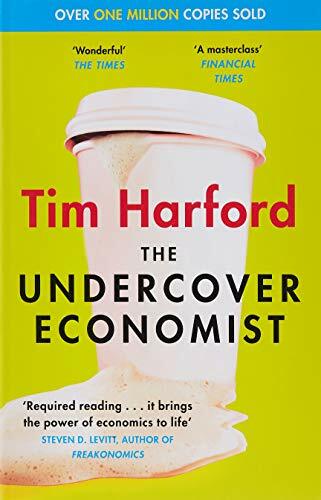 Leaving behind textbook jargon and equations, Tim Harford will reveal the games of signals and negotiations, contests of strength and battles of wit that drive not only the economy at large but the everyday choices we make.